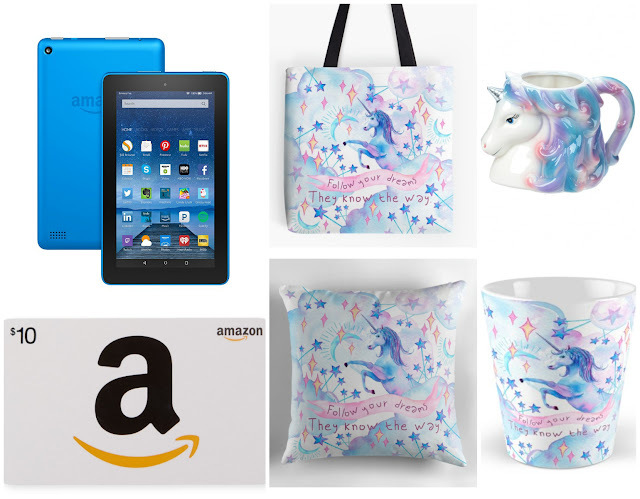 Enter this giveaway for a chance to win a Kindle Fire 7, a $10 Amazon gift card (or equivalent), a unicorn mug and a Follow Your Dreams unicorn bag, pillow & mug set designed by Nyx Sullivan. Good luck! I love unicorns because they're beautiful, magical, mythical and have a horn of pure gold. I love dragons. They are strong and fierce. So are adorable too. Since I live in Ireland I'm going to have to say the Leprechaun is my favourite. They're not very nice though and are best left alone if you ever meet one! Unicorns because of their beauty and mystic and dragons because of their fierceness. Mermaids, because I am just so fascinated by them. Probably a shape shifter. I like the idea of changing into a variety of animals. Definitely Pegasus. Who wouldn't want to be friends with a flying horse? "What's your favorite mythical creature and why?" Do vampires count as "mythical"? I would like to be a super-handsome vampire with a large collection of tuxedos and an elegantly set dinner table where I can meet my..."friends." A unicorn because you can ride on them and fly! A small friendly dragon; I'd love to be able to fly but I wouldn't want to frighten anyone! Werewolf :D just love them from the moment I read about it in New Moon by Stephenie Meyer. I love mermaids, they are so beautiful and the ability to swim underwater with scuba gear is so lucky! I love dragons because they are so powerful and fierce. I've always had a thing for unicorns. Unicorns are magical. They represent every happy dream that we've ever clasped our little hands together and tried to wish into reality. Unicorns are awesome. They're horses, but so damn much more special than horses. They are the ultimate extraordinary spin on something ordinary. I love Unicorns and Centaurs because they're both created so uniquely!!! And i really wish unicorns actually existed, so magical! The Easter Bunny - he brings chocolate! When it comes to reading I love a good werewolf or dragon story, I also like centaurs. I like hippogriffs because they're fun. Dragons and Unicorns because they are majestic. Unicorns since they are gently and mystical animals not at all scary nor dangerous. I really love the phoenix, dragons, mermaids, and unicorns. Phoenixes are unique, dragons are badass, mermaids are beautiful but scary, and unicorns are whimsical. Oh definitely the Pegasus... I always thought a flying horse was magical and majestic... a beautiful sight to behold, if they actually existed. I do love dragons, they seem to be portrayed as intelligent and interesting!! Unicorns as they are so beautiful and really majestic. Mermaids because of the ocean connection. Unicorns are my favorite because they seem so magical! I love the Minotaur as it's fearsome! The Pegasus, probably because of the beautiful wings. A Unicorn because they are every girls dream. The unicorn because they are magical and beautiful. Cyclops - they have so much character! I am going to say Big Foot is my favorite mythical creature. I am an avid reader of fiction mostly but of several genres however sci Fi or any with mythical creatures isn't one of the genres I read. One of my favorite shows when I was little was 6 million dollar man and They had several episodes with Big Foot on it. Thanks so much for this opportunity and for always having such a positive attitude. It does help so much. Fairies are my favourite mythical creatures. Having the power that is used to bring good and being completely free, is something I'd love to have. has to be unicorns! so cute! I love fairies..I have collected them for years. They remind me of childhood innocence and purity. Unicorns because they're magical and so pretty! My favorite creatures would be sirens, dragons, and Cerberus. A three headed dog aptly named Spot owned by Hades. always love Unicorns and Dragons, it seems like everyone is into them. Dragons are my favorite because they are fascinating creatures. I love Unicorns. They are pleasure creatures. I love Unicorns because they are rare like me (redhead) hehe, I also love mermaids, dragons, sirens, faeries etc! Mermaids. They are beautiful and dreamy. Thank you for this great oportunity, I love it! Coloured in young, cheerful and always related to good things. I have always been drawn to Bigfoot. Very mysterious and elusive. Always liked mermaids. I think it must have been from watching the film Splash with Daryl Hannah as a kid. Has to be a unicorn - beautiful, magical creatures! I love unicorns because they are so unique and magistic! Mermaids because they are soooooooo beautiful !!! I love unicorns �� so much. Nymph - nymphs are generally regarded as divine spirits who animate nature, and are usually depicted as beautiful, young nubile maidens who love to dance and sing. My favorite mythical creatures would have to be A dragon and a Unicorn, I know it only asked for one but I couldn't just choose one. The reason I would choose either one of them would be because they are both quite unique to their own ways. With paranormal romance being my favorite genre it is hard to pick a favorite! I love vampires, shifters the most but love mermaids too. The phoenix :) I love all kind of birds + it's so majestic and can reborn from its own ashes. Mermaids! I'm such a water baby myself and have always loved everything mermaid associated!! I like the Pegasus because they're so graceful looking. Either dragons, unicorns or fairies because they`re all so pretty and cool. I love unicorns and fairies. Mermaids as I always wanted to be One! Half human so I had more chance of being a mermaid than a unicorn! the type of Shifter's that can Change into anything big or small. I love the idea of mermaids - they sound so beautiful and mysterious! I think mermaids. They just seem so cool and like have this world of their own and don't have to worry about negative things from outside worlds coming in. Now that I know that narwahls are actually real *embarrassed face* I'd have to say dragons. If you take away the breathing fire thing, then they are really beautiful. I've always loved the idea of dragons ever since I read the Hobbit as a child. Phoenix. I like that they rise from their ashes. My favorite mythical creature is a dragon, I just think they are badass. I love unicorns, I love their uniqueness. Dragons, Unicorns, Vampires and Mermaids.